Hyper-literate. It’s a word that has NO business in Rock N’ Roll. We’re talking about a medium where some of the best words ever written are “She was a fast machine. She kept her motor clean. She was the best damn woman that I’ve ever seen.” Rock N’ ROLL MAN!!!! So what the hell is wrong with Colin Malloy? I mean, look man, I get it. You’re educated, well read, and a little bit theatrical. You want to share that with the world. You want to rock. And I, being a fan of all that is rock, ALSO want you to rock. Really, I do. Why is it then that each and every time you open your mouth I feel like you are less singing a song than simply reading a story to me? Reading a story that BELONGS IN A FREAKING BOOK. It takes an immense talent to craft a hit, or even good song. And I’m not saying that you can’t tell complex stories or use $25 words in songs (see Andrew Bird for an excellent example of this…Bird makes up, as in creates himself, $30 words and then makes you believe that they exist through pure songwriting prowess). But it takes a truly deft hand to craft such a thing, and whether or not you succeed is never determined by just by the quantity or quality of the words that you throw at the page. It has to have guts. Soul. BALLS. 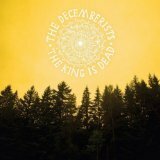 The Decemberists have none. And it’s Malloy’s fault. But that didn’t stop them from making the next great REM album despite themselves. “The King Is Dead” is an effort of straight up hero worship. They even enlisted Peter Buck to play on the album….on a song that completely rips off “The One I Love,” no less. That the band had the audacity to attempt this in the first place is sort of mindboggling. That they actually pulled it off is nothing short of astounding. This one goes out to the one I love, indeed. And it’s not that it’s a great album. It isn’t. But in tracks like “Calamity Song”, “January Hymn” and what may be my favorite song of the year so far, “Dear Avery”, they manage to utilize Buck and GILLIAN FREAKING WELCH in a way that gives The Decemberists the illusion of having a real soul for the first time in their careers. Unfortunately this newly discovered soul can’t save the album from songs like “This Is Why We Fight”, which is about as vapid a piece of early 90’s indie rock (think The Connells) that has ever been written. But it does infuse the set with an overall warmth that has been absent from ALL of their previous recordings. I’ll be the first to admit that I’m a sucker for a twangy guitar, a good 2 part harmony (with GILLIAN FREAKING WELCH!!!!) and the gentle slide of a pedal steel as a harmonica fades off behind the singers. It’s my sweet spot. I’m THAT guy. But The Decemberists have never been that band…or at least they’ve never SUCCEEDED at being that band. Now, with “King”, they have, and I think they’ve set off down the right path. And while I remain hesitant to revisit their back catalog again…for the umpteenth time…I am now much more likely to pay attention to what this band does in the future. This album is proof that they can pull their heads out of their asses long enough to create something that is more than a bland, sleep-inducing 45 minutes of never ending words and recycled riffs. So there is no reason why they can’t do it again. I’ve found myself revisiting this set more times than I would have ever expected in the past week, and can see it growing on me even more as the year goes on. The REM of long ago is long gone, and their absence has left a musical hole THIS big in me. Sure, they’ve put out records over the past decade, but they’ve all been immeasurable disappointments. And come March they are giving it yet another (whywhywhywhy???) try. But for now—and I never thought I would utter the words—I’m think I’m gonna stick with The Decemberists to fill that hole. Now if only they could do their interpretation of “Reckoning”.